The portrait’s persistent significance in the history of American art dates to the nation’s early years, particularly during the Colonial and Federal periods when it was the dominant form of art in the nascent country. As American art evolved over time, embracing traditional forms of representation (and genres, including landscape, still life, and history) and then rejecting them in favor of abstraction, the portrait continued to develop as well, absorbing changing trends and styles. In recent years, many portraits have become evident as such in title alone, as artists challenge the conventions of portraiture in the strictest sense — as the figurative representation of a recognizable individual. 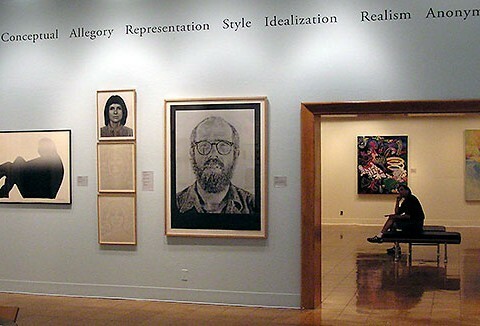 Drawing on the UAMA permanent collections, The Portrait in America considers the surprisingly varied approaches to portraiture undertaken by artists in America. 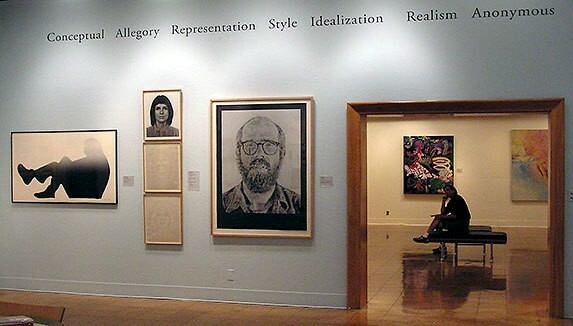 Rather than trace the genre’s development solely along chronological lines, however, this exhibition presents small groupings of very different kinds of portrayals — the commissioned portrait, the self-portrait, the iconic portrait, and the conceptual portrait, for example — rendered through a tremendous range of styles. In addition, the groupings examine works that emphasize particular aspects of their subjects — physiological, psychological, political, and/or social — to unexpected effect. These organizational choices are intended to complicate the standard definition of the portrait, to understand it as a more tenuous and more complex form of representation than commonly thought, and to thereby reflect more deeply on the ways we choose to view ourselves.